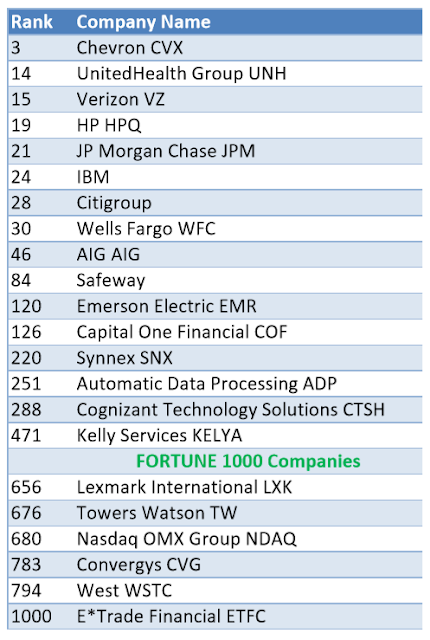 Tweet Fortune Magazine has published its annual list of Fortune 500 companies measured by revenue. As what we did with our previous articles we have filtered the list to reflect companies with shared service or BPO operations in the country. Being listed in the Fortune 500 could mean that the company has a large influence in the market and it may also show how its employees are treated trough compensation and benefits. Check out the list below; it may not reflect other companies since Fortune 500 only list companies based in the United States. The list has also been extended to 1000 companies. Working for a Fortune 500 or Forbes listed company may benefit individuals who jumps from one center to another since, less irate callers are encountered. A Fortune 500 company on your resume maybe considered as an achievement because based on experience; laziness and lackluster performance are not tolerated. Working with these companies is a proof that you can work with the best since, the type of job would be more complex compared to a regular call center post.